Marvel Studios' The Avengers is one of those flicks you think of no matter what you do afterwards. Hanging the washing - think of The Avengers, wash the dog - think of The Avengers, listen to your partner - think of The Avengers (okay so that one might get you in trouble, but I think you get the point). 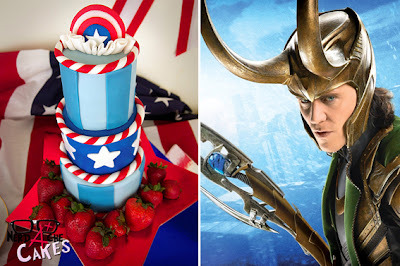 So it makes perfect sense cake decorator supreme Ant, is now proving herself 'Earth's Mightiest Fangirl' with a series of Avengers based taste-bud treats. Behold! Okay, so Loki was the film's villain, but talent is still talent. Loki’s helmet is made of 24 fondant pieces and took over 3 days to assemble. Compare that with the below to see how well this 19 year old baker detailed the helmet and spot her Captain America cake too. For more photos, tips, icing and world-class looking eats, visit Nerdache Cakes, right after the jump. Having worked with (and cursed at) fondant, I am very very very impressed. And no way in heck am I every trying that. Ever. I'll just stare in awe. I'd rather try Hellboy. Thanks Random - I have enough trouble just saying fondant! Instead I picture me as a kid reaching out five little fingers towards said cupcake, while a paternal unseeing voice booms from another room 'Not till after your dinner'. Repressed memories I tell ya! Heh. I don't have to repress it. I'm the one saying it. 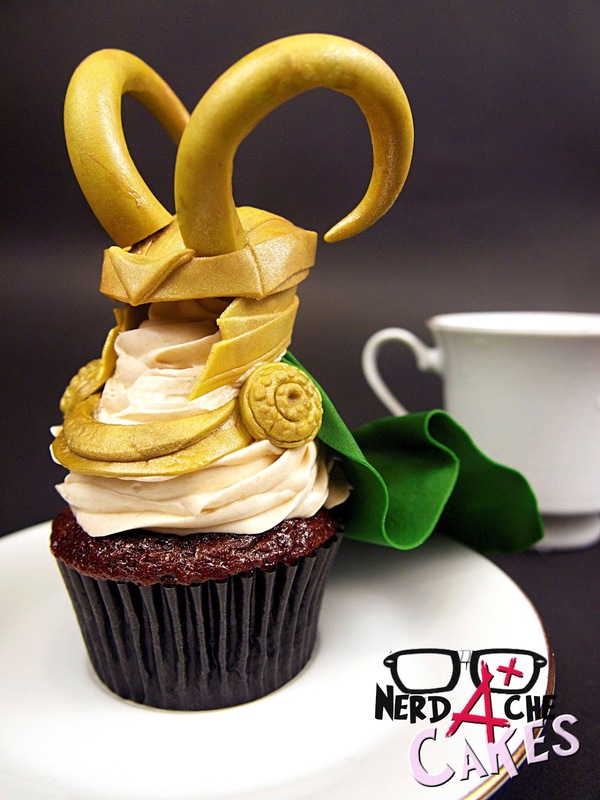 I want that Loki cupcake! I don't know the first thing of baking that, but, oh so cute! And is a cupcake. I'd eat it too! Ha - seems it's a pretty popular cupcake all round Aliera! Art takes so many shapes. I 'm with you though, I don't think I could keep it uneaten for long!